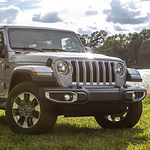 Having a robust frame and versatile drivetrain, the Jeep Wrangler is an award-winning SUV. You could request a test drive in this Trail Rated model from Ram Country Chrysler Dodge Jeep. Some of the trims in the dealer's inventory include the Rubicon, Sport, Sahara and Moab. Three signature configurations are available for the 4x4 drive in the Jeep Wrangler. Designed to switch instantly between 2WD and 4WD, the patented Selec-Trac system is ideal for all-weather performance in urban areas. Having low driving ranges for crawling on rocks, the Command-Trac system is optimized for off-road trips. Additionally, the Rock-Trac is engineered to climb steep terrains with rocky surfaces. This Jeep SUV also has the Hill Descent Control that reduces the speed on a steep inclined path. You won't have to apply the brakes when this technology comes on. The Tru-Lok Lockers are some other high-performance installations that stabilize the Wrangler on any landscape.